It took me 20-minutes to ride my motorbike the two blocks to my polling place because Kalakaua Ave., the main drag in Waikiki, was already blocked off for tonight's ho'olaule'a, the biggest block party of the year. So this election worker who's seated outside the entrance to the voting room asks me for my ID which struck me as odd. I replied "let me check the voter list" which was posted on an adjacent wall and he "offered" to find my name for me. Which I also thought was odd. I informed Mr. Democracy that I'd prefer to find my own name on the voter list by myself. The polls close at 6pm. 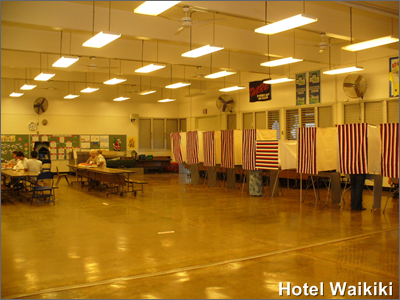 I was there well after 5 o'clock and I had 19 of the 20 voting booths to pick from. Good that you voted. I tend to prefer voting via absentee ballots. It's hit or miss here in CT. Sometimes they ask for ID and sometimes they just ask for your street address as the ID. gigi- absentee voting seems to be the future trend, accounted for over 25 percent of the votes this year. Kay- about 50 percent for me, too. Ann- this wasn't the ballot people who hand you your ballot, but an election worker seated outside the voting room whose primary purpose was to usher people into the polling room, sorta like a greeter. Every year they get different or new temporary workers for that day, so nobody knows nothing, or perhaps they know everything. Usually, the most the "greeter" asks of arriving voters is to check the voter list posted on the wall just to double-check. Glad muffy and his lapdog failed. Nate- plus, Mufi needs a break and we need a break from him. He's run for every political office in the state, usually, won. But with the rail still in the works, he should have stuck around as mayor to oversee the project he promoted. In 6-years, he woulda been governor without making himself a political adversary and incurring adversaries in his own Democratic Party. Think about it, what higher level state or city political office hasn't he sought? Kinda greedy to me. What's he's next move? Another thing, Ed Case would have been mayor if he threw his hat in that race. Strange case.